Oh man, my mind is exploding with information on close reading, text complexity, and text dependent questions! In my 16 years working as a school-based SLP, I have learned so much about applying language into an academic context. All along I have observed that there are a lot of parallels with how I teach articulation skills and early reading instruction. Lately, I have been a part of a school team diving deep into the instructional practices of close reading. And I do mean deep! 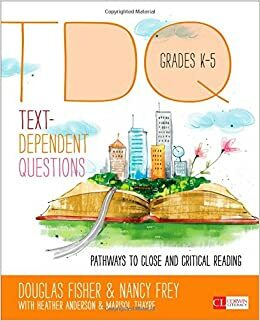 We did a book study using Fisher & Frey’s TDQ: Pathways to Close and Critical Reading. At first I was worried that I would be out of place on this team, but then I quickly realized that somewhere in the midst of the close reading gurus, there must be an SLP! It is centered around learning with a deep understanding, making connections, exploring vocabulary, and applying knowledge. I have used some of these techniques with my language students (more to come on that – with photos!). At the same time that I was taking in all of this knowledge about close reading, I kept hearing teachers talk about text dependent questions. These are used in ongoing reading assessments and students now need to be able to answer questions in a way that demonstrates their knowledge with supporting details…much more expansive than basic WH- questions about the text. My language instruction is focusing on concepts and vocabulary that tie in to these expectations: explain, compare, describe, support with details, predict, summarize, relate, apply. All skills I have taught before, but now I have a greater understanding of classroom expectations and application. I push into a third grade literacy class this year and the teacher was ready to do a novel study. She showed me a list of literacy skills to address…it is amazing how much of this list are really language concepts/skills! We split the class in half and each chose a novel to work on these concepts. Freckle Juice was in the reading level range for my group (grade 3.6, level M). I selected this one because I already had a base of materials to work with and *amazingly* none of the children had read it before! When I was organizing my materials, though, I started to worry that I didn’t have enough grade level material. The packet was useful for my language kiddos that needed the extra support and visual structure, but could it stand up to the test of a real, live 3rd grade class? Turns out, yes! We worked together throughout the whole packet on expanding, explaining, and applying. 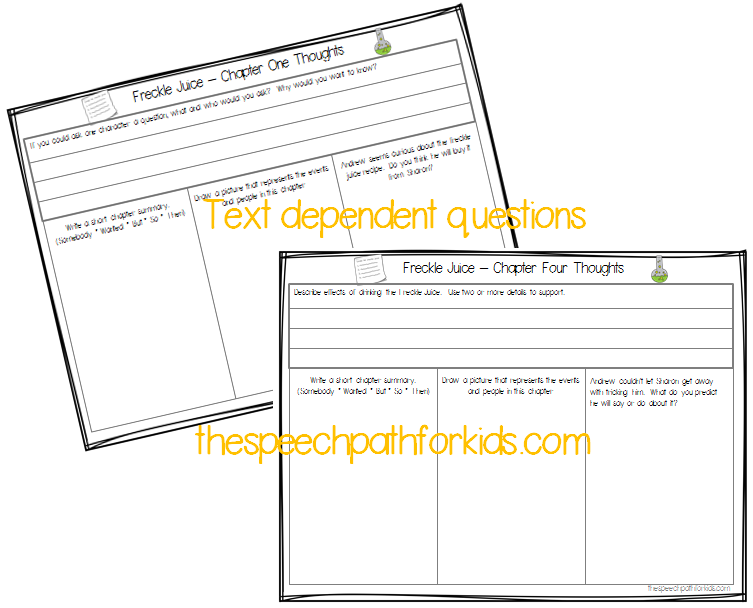 chapter thoughts – text dependent questions that took their thought process to another level. It also gave me a differentiated set of questions to work with. Now I have a set of more literal WH questions and a set that requires more application of concepts. I used both with my 3rd grade class, but you could also use one or the other depending on how you needed to differentiate. 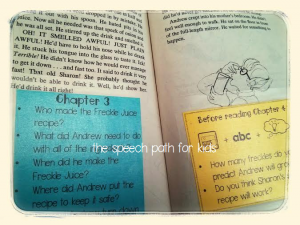 If you are also looking for ways to connect your language lessons with classroom expectations, you can check out the Freckle Juice packet here. You can read more about my process in creating it here (with pictures).